Bernese Mountain Dog Dog Chalkboard featuring your favorite dog breed - the Bernese Mountain Dog. 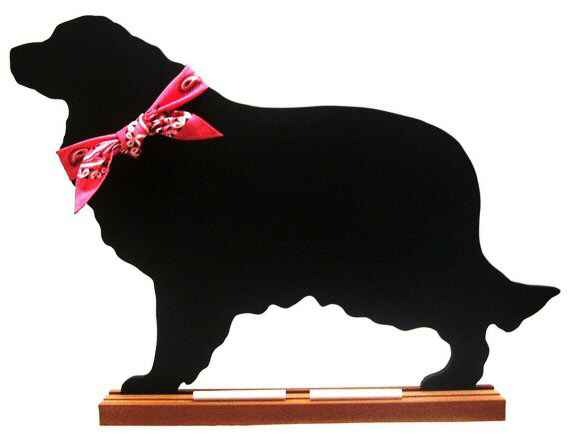 Our Bernese Mountain Dog decorative dog breed chalkboard is completely handcrafted of 3/8" wood, with a 3/4" thick base. It is hand finished on both sides. Table Model Dog Breed Chalkboards are perfect for shelves, counters, kitchen islands, and of course, tables. They stand on a stained, wooden base, which includes a chalk tray. Wall Mounted Dog Breed Chalkboards are the answer when counter space is limited or when your walls need a dramatic focal point. A narrow chalk tray runs along the bottom and there is a hanger on the back.